To help you start this week on an optimistic note, I'm going to share with you the story of a man who at the age of 65 with just $105 and a chicken idea, built an industry leading franchise. I really like the way his story was laid out on Ronford.net and I won't attempt to edit it or combine it will other sources. I will simply paste it here for your reading pleasure and, hopefully, to inspire you to never give up. Colonel Harland Sanders, born September 9, 1890, actively began franchising his chicken business at the age of 65. Now, the Kentucky Fried Chicken® business he started has grown to be one of the largest retail food service systems in the world. And Colonel Sanders, a quick service restaurant pioneer, has become a symbol of entrepreneurial spirit. More than two billion of the Colonel's "finger lickin' good" chicken dinners are served annually. And not just in North America. The Colonel's cooking is available in more than 82 countries around the world. When the Colonel was six, his father died. His mother was forced to go to work, and young Harland had to take care of his three-year-old brother and baby sister. This meant doing much of the family cooking. By the age of seven, he was a master of a score of regional dishes. At age 10, he got his first job working on a nearby farm for $2 a month. When he was 12, his mother remarried and he left his home near Henryville, Ind., for a job on a farm in Greenwood, Ind. He held a series of jobs over the next few years, first as a 15-year-old streetcar conductor in New Albany, Ind., and then as a 16-year-old private, soldiering for six months in Cuba. After that he was a railroad fireman, studied law by correspondence, practiced in justice of the peace courts, sold insurance, operated an Ohio River steamboat ferry, sold tires, and operated service stations. When he was 40, the Colonel began cooking for hungry travelers who stopped at his service station in Corbin, Ky. He didn't have a restaurant then, but served folks on his own dining table in the living quarters of his service station. As more people started coming just for food, he moved across the street to a motel and restaurant that seated 142 people. Over the next nine years, he perfected his secret blend of 11 herbs and spices and the basic cooking technique that is still used today. Sander's fame grew. Governor Ruby Laffoon made him a Kentucky Colonel in 1935 in recognition of his contributions to the state's cuisine. And in 1939, his establishment was first listed in Duncan Hines' "Adventures in Good Eating." In the early 1950s a new interstate highway was planned to bypass the town of Corbin. Seeing an end to his business, the Colonel auctioned off his operations. After paying his bills, he was reduced to living on his $105 Social Security checks. Confident of the quality of his fried chicken, the Colonel devoted himself to the chicken franchising business that he started in 1952. He traveled across the country by car from restaurant to restaurant, cooking batches of chicken for restaurant owners and their employees. If the reaction was favorable, he entered into a handshake agreement on a deal that stipulated a payment to him of a nickel for each chicken the restaurant sold. By 1964, Colonel Sanders had more than 600 franchised outlets for his chicken in the United States and Canada. That year, he sold his interest in the U.S. company for $2 million to a group of investors including John Y. Brown Jr., who later was governor of Kentucky from 1980 to 1984. The Colonel remained a public spokesman for the company. In 1976, an independent survey ranked the Colonel as the world's second most recognizable celebrity. Under the new owners, Kentucky Fried Chicken Corporation grew rapidly. It went public on March 17, 1966, and was listed on the New York Stock Exchange on January 16, 1969. More than 3,500 franchised and company-owned restaurants were in worldwide operation when Heublein Inc. acquired KFC Corporation on July 8, 1971, for $285 million. Kentucky Fried Chicken became a subsidiary of R.J. Reynolds Industries, Inc. (now RJR Nabisco, Inc.), when Heublein Inc. was acquired by Reynolds in 1982. KFC was acquired in October 1986 from RJR Nabisco, Inc. by PepsiCo, Inc., for approximately $840 million. In January 1997, PepsiCo, Inc. announced the spin-off of its quick service restaurants -- KFC, Taco Bell and Pizza Hut -- into an independent restaurant company. The spin-off should be completed during the fourth quarter 1997. The new restaurant company, TRICON Global Restaurants, Inc., will be the world's largest restaurant system with more than 29,500 KFC, Pizza Hut and Taco Bell restaurants in nearly 100 countries and territories. 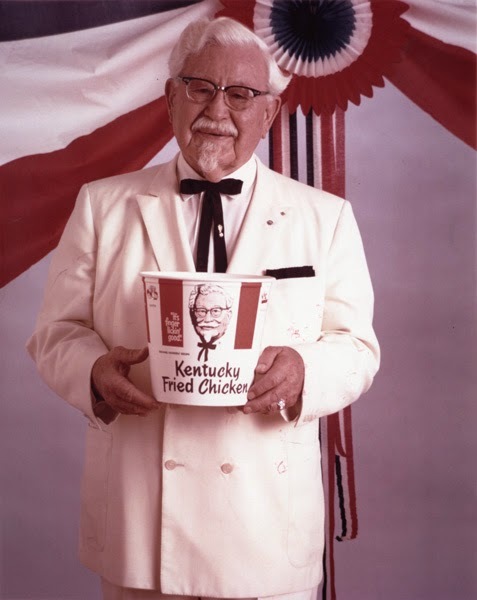 Until he was fatally stricken with leukemia in 1980 at the age of 90, the Colonel traveled 250,000 miles a year visiting the KFC empire he founded. And it all began with a 65-year-old gentleman who used his $105 Social Security check to start a business.